Germany won its first game in 2010 FIFA World Cup against Australia 4:0. 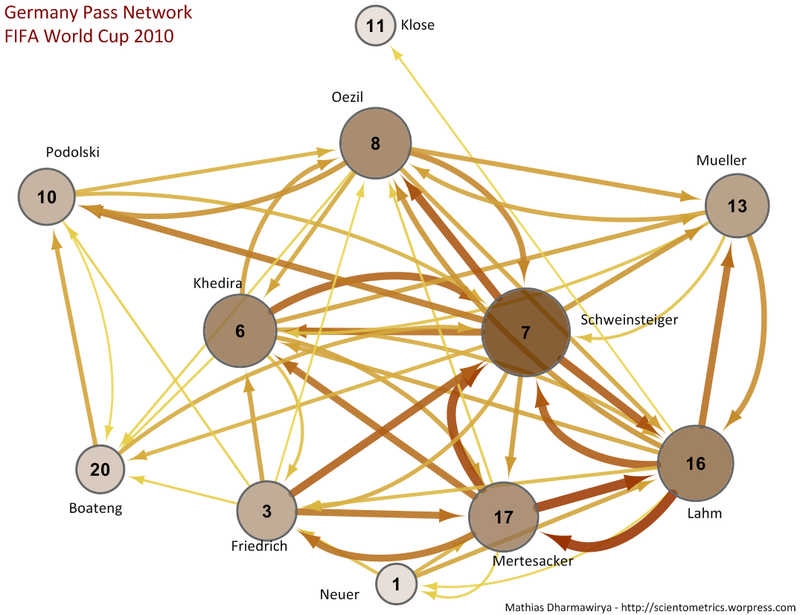 Inspired by what FAS.research did in visualizing the pass-network of soccer matches (there are a number of matches from the 2010 FIFA World Cup as well), here is the Germany pass-network against Australia. The defenders contributed 250 out of 456 passes (54.8%)! Passes to defenders 45.9%, midfielders (Schweinsteiger, Khedira, Oezil and Gomez) 29.2%, forwards (Klose, Cacau, Podolski, Marin and Mueller) 22.3%.